First of all, I promise this will not be a marathon post like the last one. 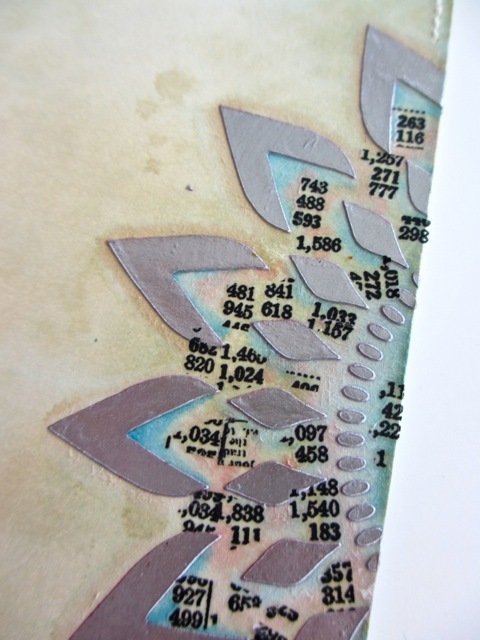 Today, we're talking about journal pages. Does every book need them? the answer is no. I know there are more than one of you who hate their handwriting, don't like relating stories or just don't see the need. Remember, it's your journal, do what you want. For me, I usually journal in small snippets, telling highlights of a story. That way I don't have to tell the whole story, my handwriting doesn't get out of hand, and I still get the feeling of the event. I do all the writing as the pictures are being added. I also think of a journal page as a break from the rest of the book. By that I mean, I usually use lighter colors or no color at all, so the handwritten text is the focal point. 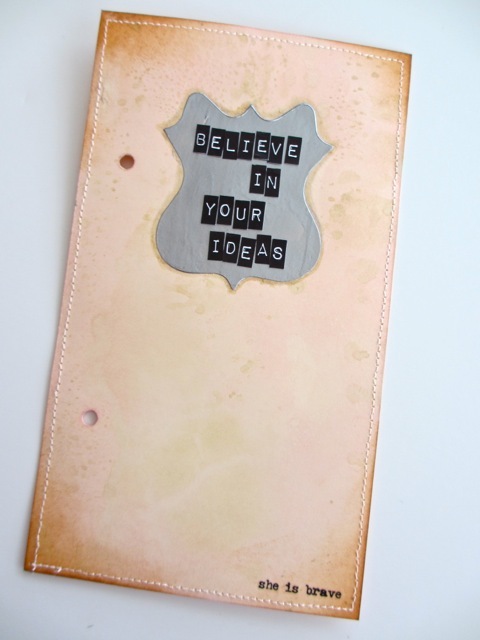 Remember, these are just ideas to get your thoughts working...you may journal a totally different way. I start again, with the same four page as in all the other sections. I decided to use the Blending Tool to add Distress Ink to each page. I did two pages in Spun Sugar and two in Tumbled Glass (front and back). I wanted a bit more depth so I decided to use Antique Linen Distress Stain. 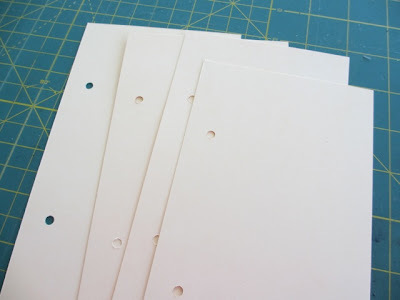 I used it the same way I did on the the Divider pages. Squeeze out on non stick craft sheet and spritz water. Swipe the card and dry. Remember to keep that paper towel right beside you to blot off excess in between drying and swiping. How good do these look? I kept it light and purposefully did not fully cover the Distress Ink foundation. 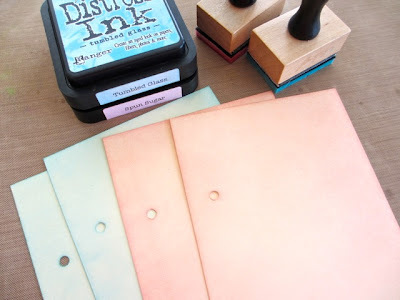 The Antique Linen Distress Ink makes a great worn look. So what to do with the 4 pages? Enter Silver Embossing paste, new from Wendy Vecchi. I had this on my cart to try and did a few test runs on my own. It has a very creamy consistency and goes on easily with a scrapper or an old credit card. 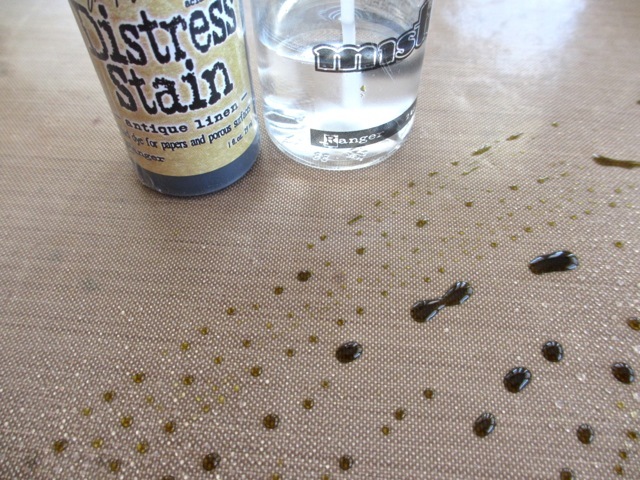 As it dries, it gets much flatter and shinier. I am the proud owner of 4 stencils, all from Crafter's Workshop. I mention that so you know I am a novice when it comes to stenciling. 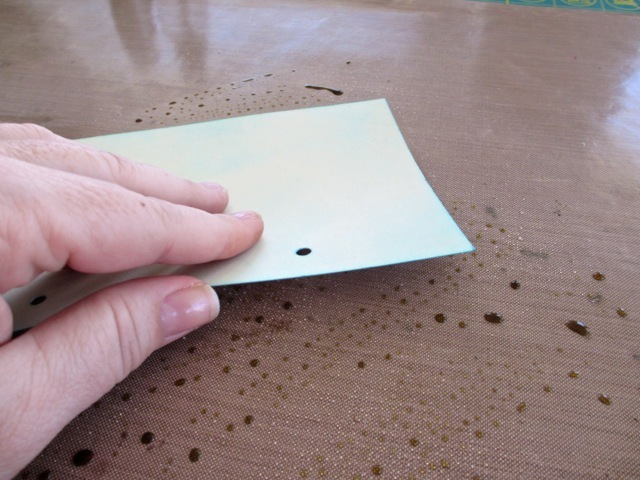 I started with a basic stencil pattern on the edge of the page. I taped it down with Tissue Tape so I didn't have to worry about the paste going onto the page. You can see what I mean in this photos. I used the craft scrapper to add the paste over the stencil. The paste went on smooth and I had no problems controlling it. perfect...did I mention I was a novice? So if I can do it, you can do it. Okay, another page, another stencil. 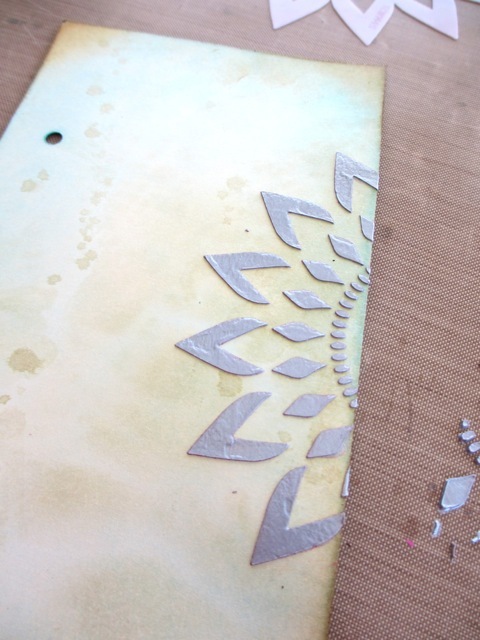 This time I laid the stencil on the page edge but I purposefully drug the scrapper in a wavy motion down the stencil so that I did NOT cover every open space. Well, like I said I only have a few stencils so I decided to see if I could make one. 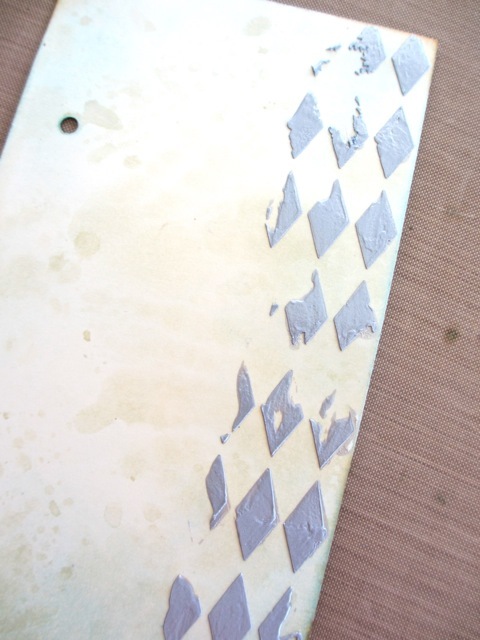 I cut one of Tim's masking sheets to fit the Regal Crest die and ran it through the Vagabond machine. The steel rule die cut it perfectly and did not "stretch" the plastic at all. 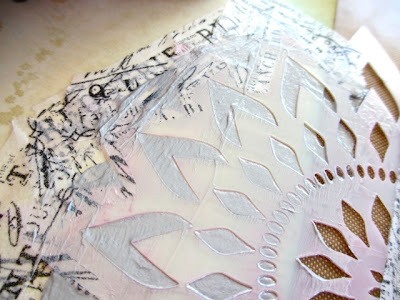 I taped the plastic over the page and slowly pulled the Embossing paste over the pattern. I felt like I had to go much slower just because the leaves are so detailed. But look at that...I lifted the mask I made and there it is, a perfect image. Success! 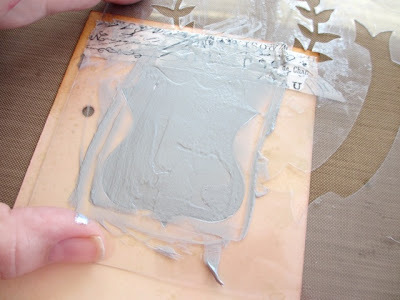 love me some silver Embossing paste! 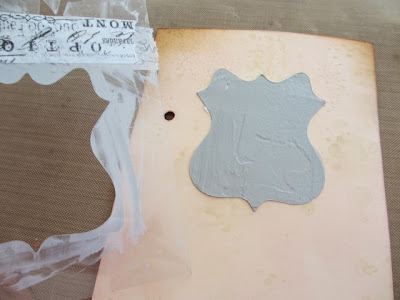 Okay, just one more...since I had already cut the stencil I wanted to try the shield shape. A bit harder to keep the larger space level so I just kept at it till I was happy with what it looked like. I think it came out pretty darn good. By the way, if you are not a silver person, it does come in other colors like gold, black and white...so more testing in the future! Here are the finished cards...totally different from the other pages in the book, a respite from all the bright color. I think they will look really good once the they are written on. I added some stitching to each page just to keep it consistent. 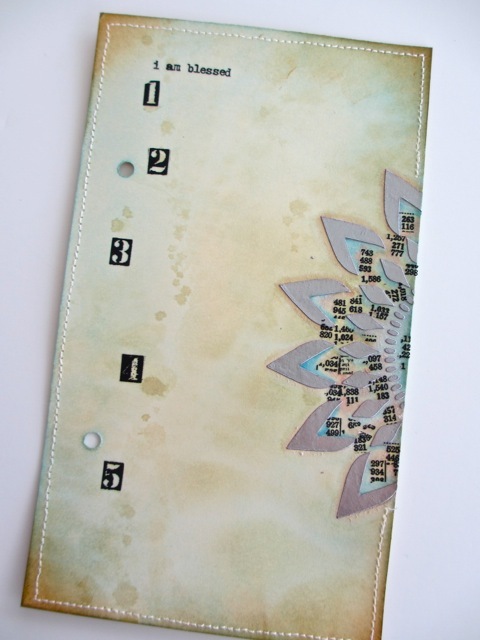 Here I used Remnant Rubs to add a phrase at the top and numbers down the side. I find this the easiest way to journal...make a list. I also used part of a Remnant Rubs number block to fill in the flower shape as well as Distress Markers - Antique Linen, Spun Sugar, and Broken China to color the flower. 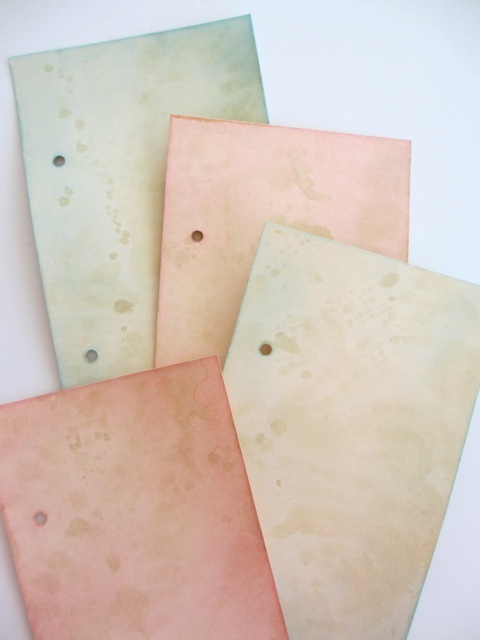 Because this is manila cardstock not watercolor paper, you cannot manipulate the color as easy. In all honesty, I do it backwards... using the water brush first, then the marker. It's a lot of back and forth with the marker and the water brush but it's worth it. 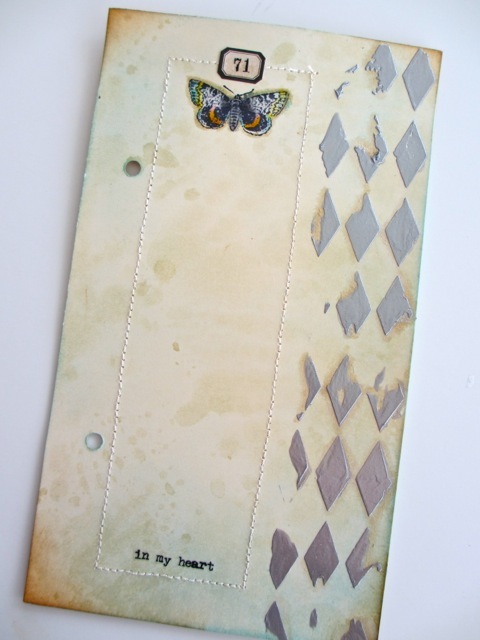 I used the Stampers Anonymous set Tiny Things that was just released this month to add the butterfly at the top of the stitched rectangle. 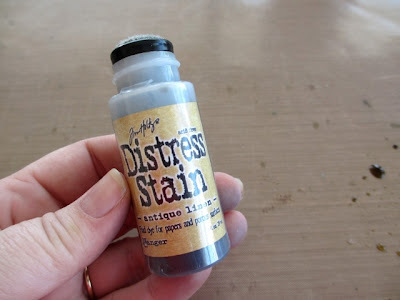 Also, Distress Marker Antique Linen around some of the harlequin shapes to make them more aged looking. Just a little message to myself. I am really a very a private person...much more comfortable with a small group than in the huge social media world. I also find it challenging to be creatively authentic and meet the fast pace of the blogging world. All thoughts that are not going to be solved in this forum but relevant to the mini book I am creating. 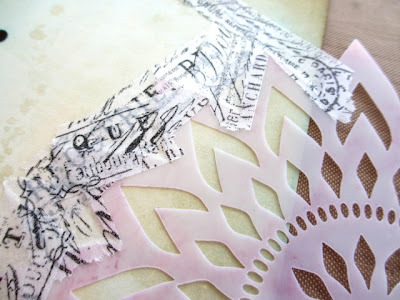 As for the page - love the new little Label Letters so I could just spell out just what I wanted to say. 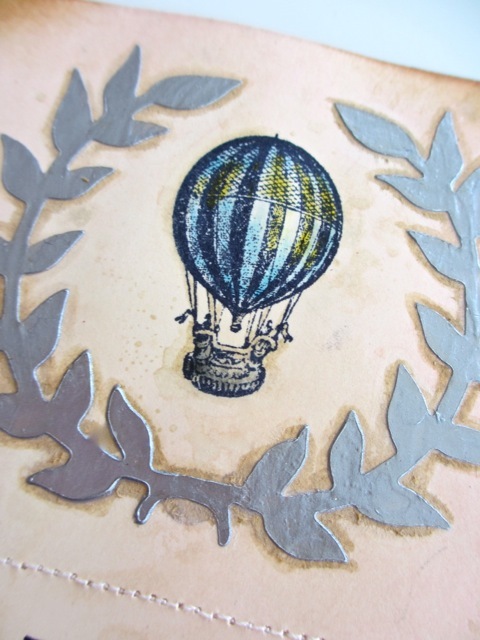 Another Tiny Things Stamp (the balloon), perfect for travel thoughts. Love that balloon! I used the Antique Linen DM around the leaves. It was very subtle effect so I went back and made it more pronounced. I thought it looked better with the darker color, like something that had built up over time. It's starting to take shape now...loving the colors! 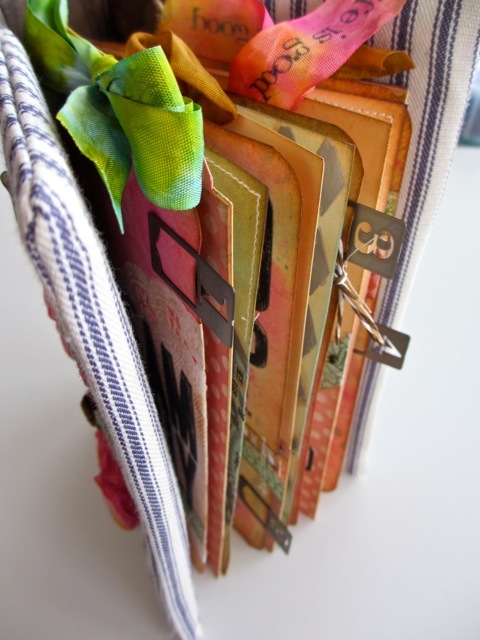 Well, that's it for the journal pages...now we march forward to folds and flip-outs...one of my favorite things. 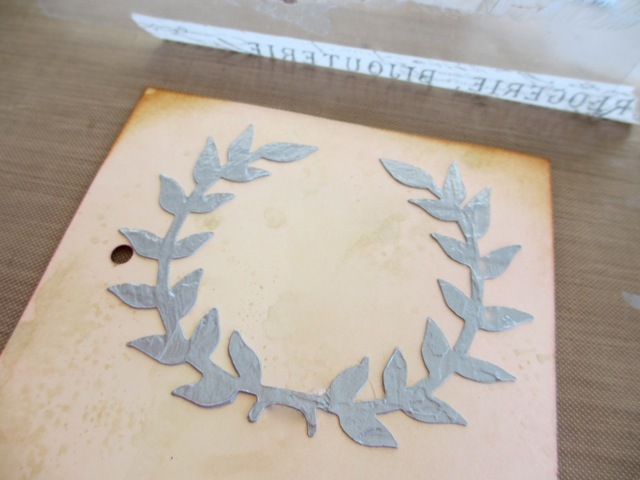 This is the part where I get to start adding metal embellishments (my favorite). Have a great week every one...get your journal pages done this week so you will be ready for flips and foldouts! 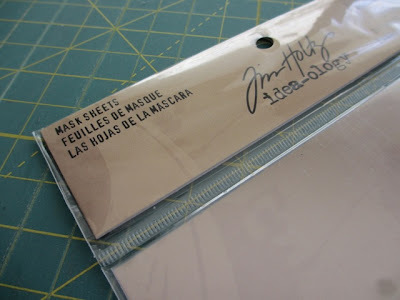 here's a tip...if you ever want to tone it down/antigue it...use some archival ink OVER the dry paste...MAGIC! Fantastical! I love every tiny detail! Love the water first then color bit too! 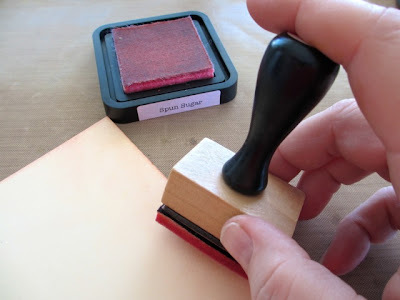 Yummy..I am grabbing my keys and cc and running out to get embossing paste.. I love texture..I can hardly wait to play..
Oh wow!! I love this!! Thanks for all the info!! 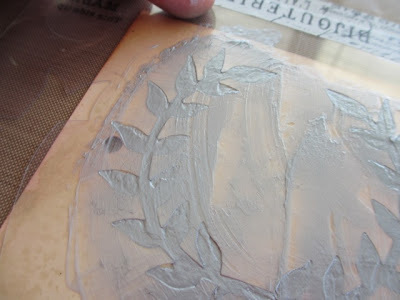 I just starting using the embossing paste/stencils myself! 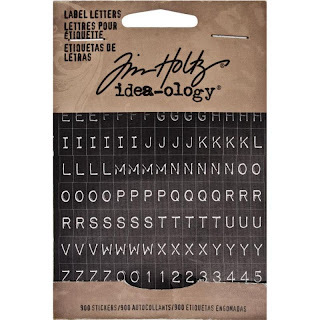 I ran out and had to buy more stencils! It is so much fun. I love it. Your cards are so pretty, too. also love your videos. wonderful pages. 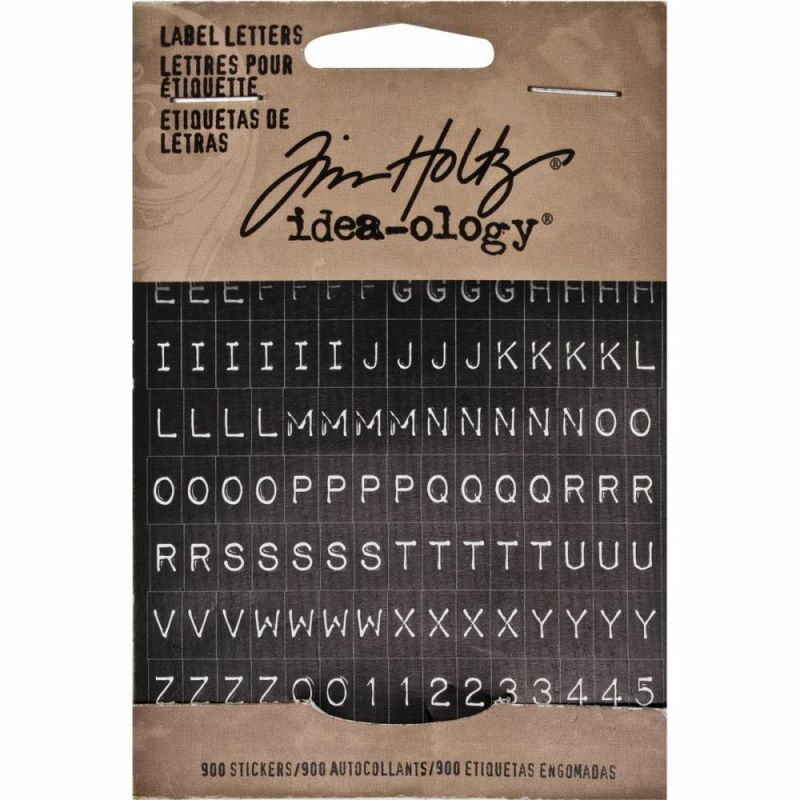 didn't know you could make your own stencils. must get some of this stuff! Wonderful!! As always, beautiful lady, you are a genius. Indeed, Believe in Your Ideas, because you inspire a lot of people to believe they might just be able to accomplish something creative with your coaching! Fantastic pages. Thanks for the tutorial. 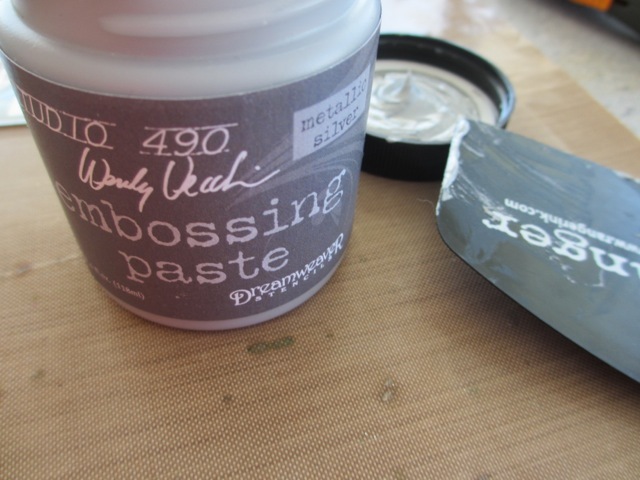 Gotta get me some of Wendy's Embossing Paste!I love how your book is coming together. Loved this post and the last post. Beautiful pages. This is SUCH an awesome project. 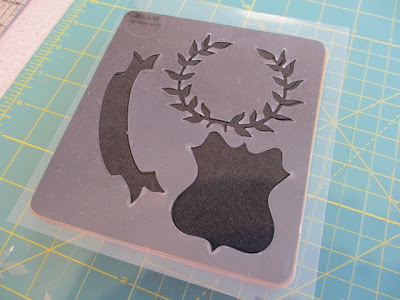 Thank you for your amazing step by step instructions...thinking about what stencils I can make from my die-cuts! Paula, I don't know what I would do without you. Being able to clearly see how to use so many great products and to have your projects too...perfect! 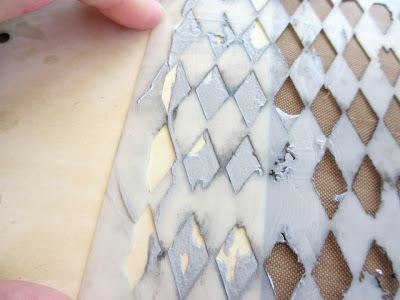 Spied a jar of embossing paste sitting on TH desk in a picture on his blog before CHA when he was talking about all the new products coming out. Asked if this was one, never heard anything back. 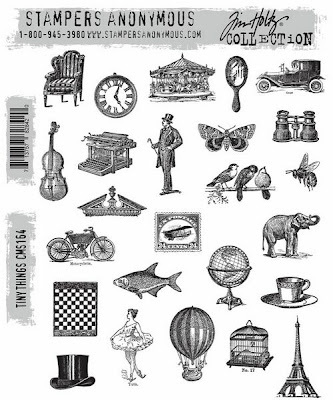 No wonder it's a Wendy Vecchi product! Looks like a great product to add to the stash! 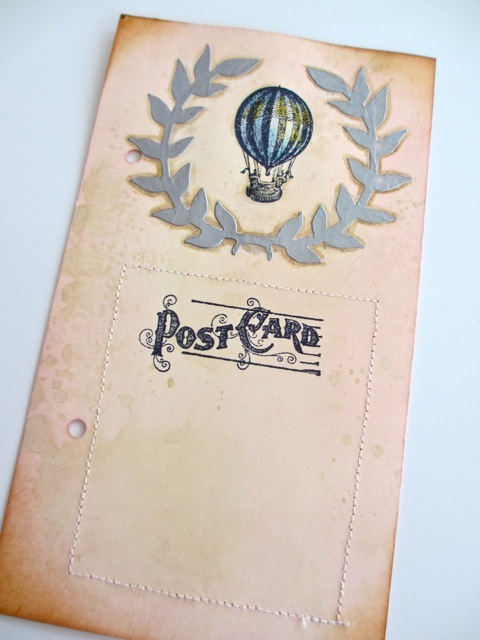 Going to have to give it a try after seeing your pages, loved how you finished them off!!! I just love your work. Thank you for taking the time to photograph all the steps along the way. I never knew how challenging that is until I started my own blog. Now, I am in awe of a well-done step-out. And this was very, very well done. I totally missed this post. Wow, Paula, you are such an inspiration. You make simplicity look so easy, and I know it is not! I love the way you combined the stamping, rubs, and stencil paste. SO inspired by this! thank shelly...right back at you. always inspired by you.